5 Solid Reasons You Should Build An App For Your E-Commerce Website! The growing number of smartphone applications is undoubtedly a game changer for e-commerce businesses. Mobile apps have cloud-based storage and they allow users to easily purchase items via multiple handy devices. No doubt, smartphone apps are portable, cost-effective and easy to use as compare to an e-commerce website. Therefore, in this post, we will share reasons to build an app for e-commerce websites. Here are 5 reasons to build an app for your e-commerce website. From a recent study based statistics, it is come to know that about 78% of users prefer smartphone apps to explore their favorite shopping services than their mobile browsers. Mobile apps will make the shopping experience of your clients faster, more secure, and it will grab the attention of more users. In addition, your customer will not need to worry about remembering your website instead they can access your shopping portal with their fingertips. 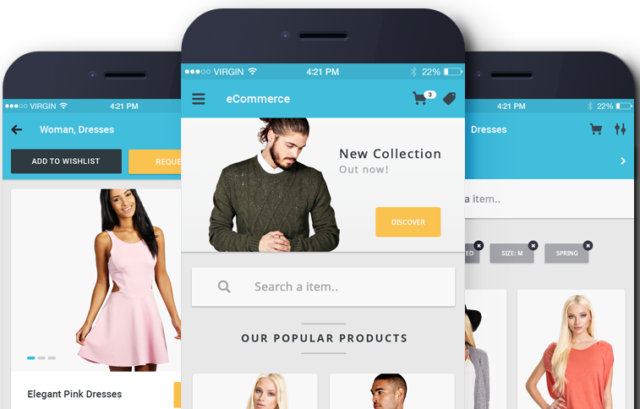 Thus, in today’s competitive world e-commerce mobile app development would provide you a great advantage to expand your business operations. A proportion of online buyers prefers smartphone apps due to its fast and secure payment method. When you develop a mobile app, you’ll provide better payment options to your current and potential customers. This will motivate the customers to purchase stuff from your app because of its security features. Moreover, it also makes the transaction easier on the shopper’s hand as they don’t need to carry cash or wait for change. Keep in mind to facilitate your customer with secure payment options via your mobile app to grow your sales graph speedily. This is the main reason that will surely make your mind to facilitate your customers with a smartphone app. When you will introduce a mobile app for your e-commerce business your customers will install it and share it with their friend’s circle as well. This will enhance the popularity of your brand as well as attract more customers to your business. You can also share your app on popular socializing platforms such as Facebook, Twitter, Instagram, and LinkedIn to take your business to the next level. When it comes to building brand loyalty mobile apps play the key role. Nothing helps you to build a strong relationship with your customer than a mobile application. This is because every time customers use their phone they see your app on their mobile home screen. Additionally, your app will remain with your customer everywhere so that they could easily start shopping anytime from anywhere. So, if you want to build loyal customers then you should build a mobile app first for your e-commerce website. Otherwise, you can’t grow your e-commerce business to a peak level. Mobile apps let you deliver notifications regarding your brand new offers and products. Whenever users will open up your app over their android phones, tablet, or iPhone they will see new notifications. In this way, you can persuade your customers to purchase stuff from you immediately. Therefore, build a mobile app and use the power of notifications to boost up your sales with special promotional offers. Else, you will miss a great opportunity that can help you to expand your business with the better outcome. Kane Williamson is the writer of this post. He serves at Dissertation Crown a local business firm with his digital marketing skills. With a vast experience in eCommerce and online marketing, he knows how to promote a brand using the online medium. He is fond of playing badminton and tennis. You can reach him via Twitter, Facebook, and Google Plus.